Because God is profoundly ethical, because He is the holy God, it is necessary that His people who are in a covenant with Him manifest His same character, His same behavior, in their relationship with Him and in their relationships with other human beings. To be in covenant with God is to become how God is and to do what God does! And Jesus set the standard and the example for us in this regard: “So Jesus explained, I tell you the truth, the Son can do nothing by himself. He does only what he sees the Father doing. Whatever the Father does, the Son does also” (John 5:10). As people who are in a covenant relationship with God, we can know what God is like and what God is doing and, consequently, what we should be like and what we should do, by studying God’s Word, the Bible, and by obeying the guidance and direction of His Holy Spirit Who dwells in us and speaks God’s Word to our hearts, minds and consciences. 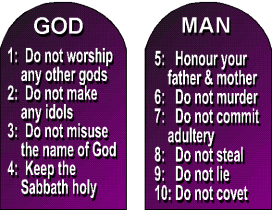 This entry was posted in God's law, Holy Spirit, idolatry, Ten Commandments and tagged Bible, God's Law, holiness, Ten Commandments. Bookmark the permalink.